Day 2's adventure would be a led trip in to the Great Orme Mine. Another leisurely start to the day with the group meeting up just passed the half way tram stop at 10am. Our guides were already there and kitted in boiler suits. Keith had joined us for this trip and we all began kitting up. The walk to the shaft was only meters away and we were all happy to get out of the wind and on with exploration. I'm not sure what I was expecting, but the nondescript walking, stooping and crawling muddy passage wasn't really it. For once I felt no need to get the camera out and before I know it we were heading back to the surface after less than a couple of hours. First up I popped to get changed and took a few pics with my phone as the others exited. Lucy flew up the 20m pitch and so her initiation in to the world of SRT has officially started! 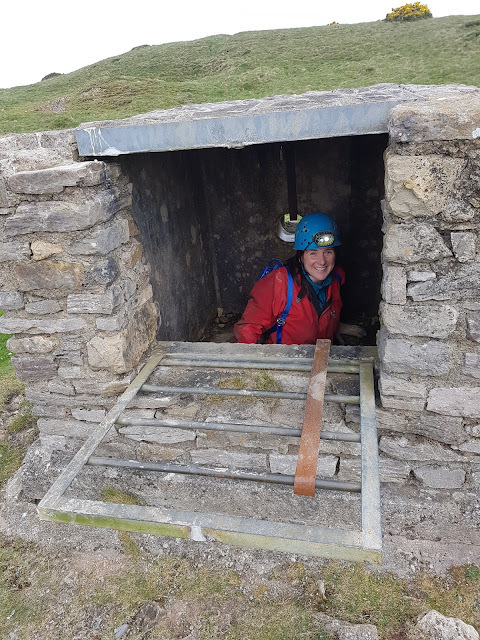 With more of the day left than we had expected we headed to the top of the Great Orme for tea and cake before Keith suggested us muggles might want to have a go at the mysterious world of geocaching. We had a romp over the hill side and were thrilled when we found the hidden stash! Unfortunately it was time to say goodbye to Lucy and Mike, but the rest of us were keen to take in the scenery around Happy Valley and continue with the geocache quest. Eventually the rumble from the bellies could be ignored no longer and we headed in to Llandudno to collect traditional fish and chips to eat on the beachfront. I decided I wanted to eat mine on the beach itself and couldn't understand why the others weren't following......that is until I was mugged by seagulls! I beat a hasty retreat and guarded what was left in my tray. The evening took a somewhat surprising turn when after Loz headed to campsite, Kay and Jess decided they wanted to visit a karaoke bar! Lucy survives her first prussic and still smiling! The screen says it all!